AK Travels is one of the best Highway Travels in Bangladesh. Ak Travels provides high-quality buses for the journey. If you want to travel from Dhaka to Chittagong, Dhaka to Jessore, Dhaka to Shatkhira, Dhaka to Benapol. Like Our Facebook Fan page to get the latest updates of this “AK Travels All Counter Phone Number” and get future updates. Hope, you will share all bus services phone number on your blog. Because sometimes it need urgent. Thanks for this post. AK Travels is now chitering with Passenger , They are not fully take care of Passenger , I lost my all Documents, 2 Endroied Mobile Phone, 22000/ Taka , ATM card, National I Card,and some Purchase , Very Disgusting experience , My Travel date was 16.04.2017 Time at 11.15 pm , Dhaka to Lohagara.My seat no -G4, I am Confarm my side seated person senceless me after two days I am getting Knowledge , I wan’t AK travels owner person this type of work no body can except , This type of work with including Your supervisor and G-3 Passenger.Please note this document and sarch that day who is actual guilty and who will support them. Thanks for your useful review about AK TRAVELS. It will help the future traveler who wants a decent review about the service of AK TRAVELS. Ak travels company era akta new business khule niyese.ami 4 july savar theke Ak travels ye uthi.but koyek din por july friday nijeke bisanay dekhte pai.dukkher bisoy suvervisor amar sobkiso niye amake road ye fele dey.eder ki kono manobota nei.sobar oddsse bolsi ak travels ye keo trip niben na.nite hole nij dayette niben.tahole apnader obosthao amar moto hobe. Wrong contact number…….All counters.CDMA service means City cell ..Now closed. …. 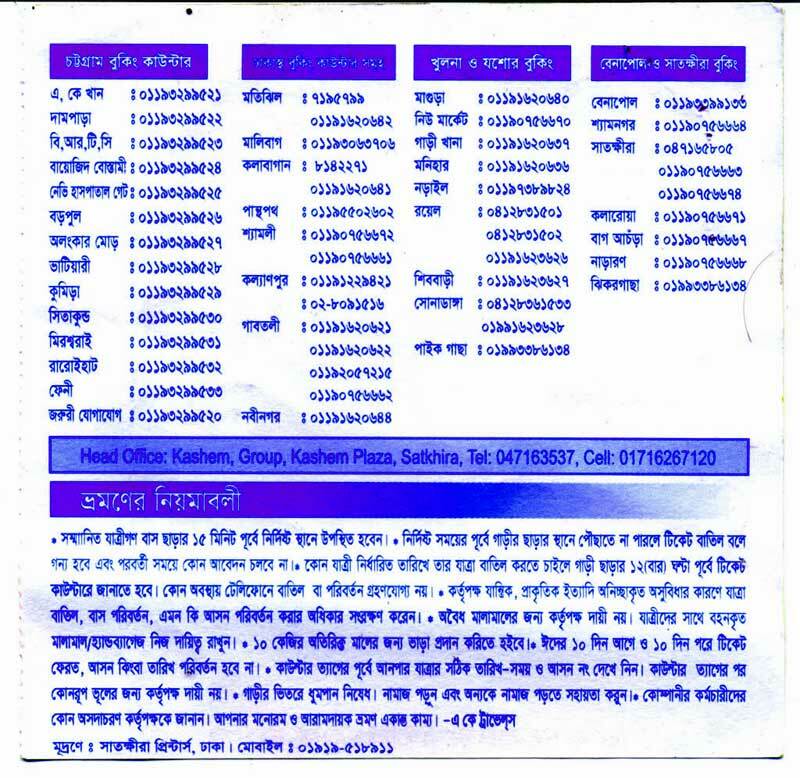 Many of Contact number need to update. Please do as soon as possible. This service is not good. I mean its run by some unskille full person. now we enjoy a painful local service by a.k travels Dhaka to satkhira bus.